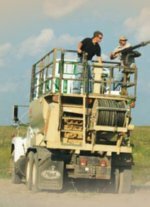 Hydroseeding is the most effective process available for controlling erosion and establishing herbaceous ground cover on recently disturbed sites. Hydroseeding is a process where a slurry of fibrous mulch, seed, and fertilizer are sprayed over prepared ground. The slurry includes tackifying agents that hold the mulch together, creating an effective barrier against erosion until herbaceous ground cover is established. Hydroseeding is more efficient than sodding, broadcast seeding, or any other method of establishing turf or controlling erosion. Please contact MRM about our professional hydroseeding services today.